My front load washer isn't powering on - How to diagnose? My Samsung front load washer (wf0500nce) suddenly wouldn't turn on - press the power bottom and nothing happens - no lights, no life. The outlet, the plug and the cable are all fine. I took out the door switch and tested it for continuity and that checked out (although i am not sure if there being continuity means door switch is OK). I manually depressed the spring loaded switch to simulate the door being closed but it still wouldn't turn on. How do i go about finding the fault? I don't see any fuse from noise filter to board. 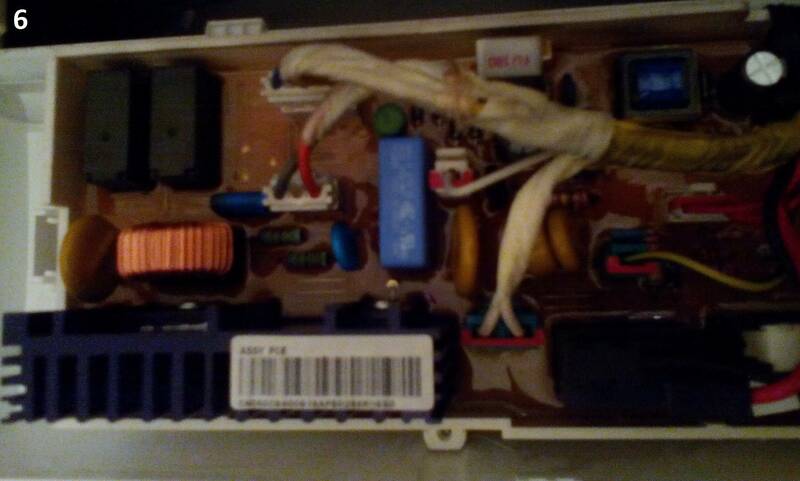 I do see what i think is the fuse in the board. I circled it in the picture. Sorry my phone's camera isnt the best. Yes oldturkey03, I am not showing any voltage on the relay you marked in the picture above. No 125v, no 220v...just 0. Do you think it could be the fuse at the board that's blown? Kato x hard to make out but it is possibly a fuse. Any idea how i can test the fuse? I can't just take it out because its put on with some kind off putty/glue seal. Did you figure this out? Same problem with mine. Holy $@$*. Nobody has an answer. WTH??? Kato x there should be a fuse between the noise filter and the Main PCB. 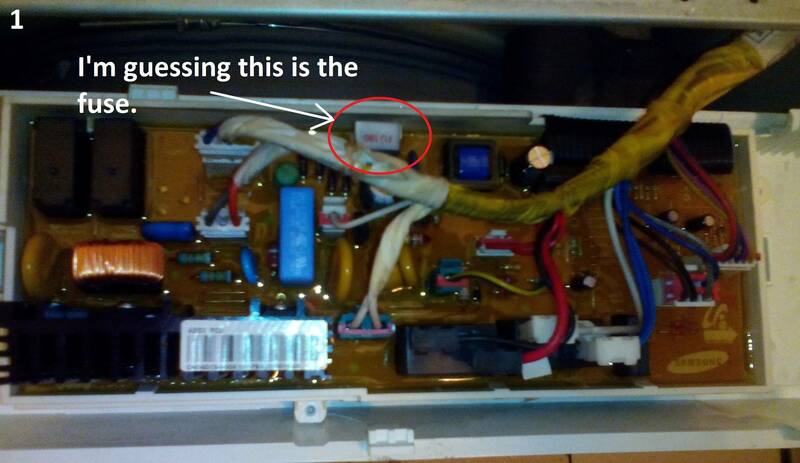 Check the fuse on the inside of your washer. Check that one for continuity and/or check to see if you have power on the Main Control PCB (blue wire from noise filter to connector Main on PCB Main Control). Let us Know what you find. Kato X no. That is the washers Pressure Switch. Follow the wiring from the Noise Filter. Also, consider posting a clearer picture of the circuit boards and lets see if we can identify more on it. No power at the supply relay. No power at the the other connector you pointed at with the blue arrow in the picture (although i am not so sure how to go about testing for power at this location since its only one wire - i tested with one multimeter lead, got no power...and then i tried with the other lead, also no power). As for testing a line after the noise filter, i am not sure where to test. Do i have to break the insulation of a wire to probe the conductor? 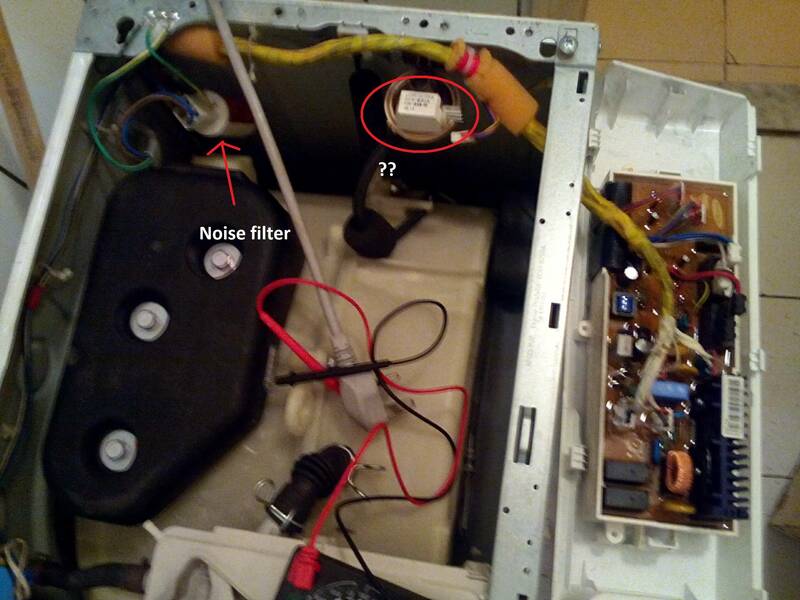 I back probed the connector at the noise filter - not the connector from the plug cable but rather the other one which comes from the washer. I got power on there. Kato x one probe on the connector and the other on ground might show some voltage. If you have power on the line past the filter, you have power on that line as well. Just checked again...one probe on that connector and the other on the metal frame/rail for round. I got 125v...although the power source is 220v. What now? Kato X that is on the connector at the board? Do you show 220V on the filter. 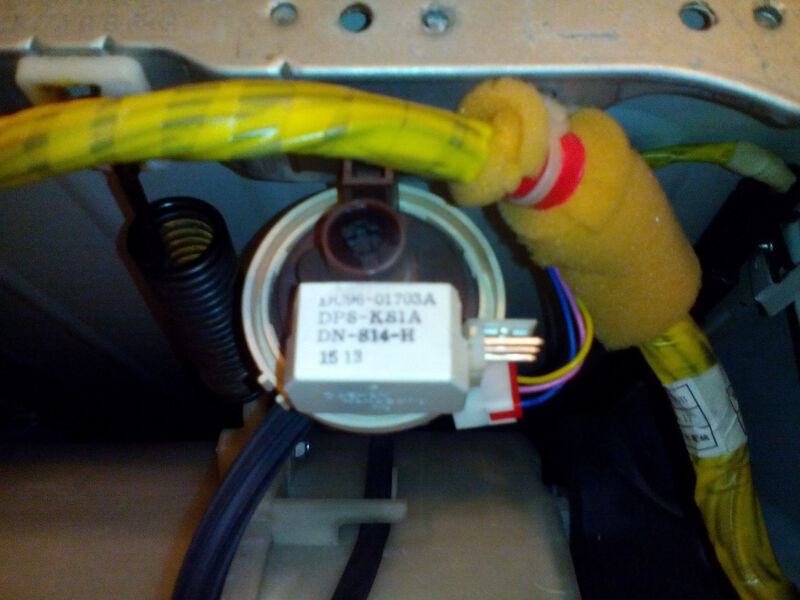 Does your washer show 220V all the way to that? First unplug it for five minutes to allow it to reset. Then see if it responds. Did that, several times...even a whole day, no go. Did you ever figure this out? Same problem with mine. Anyone ever figure this out? Mine is 1 day old! Powered it down last night after using it. Won’t power back on today. I just replace the board and I was good again. Basically visual inspection of the control board revealed damaged components. My speculation is those components on the board got damaged be due to an electrical surge, the root cause wasn't determined. Kato x будет вечно благодарен.